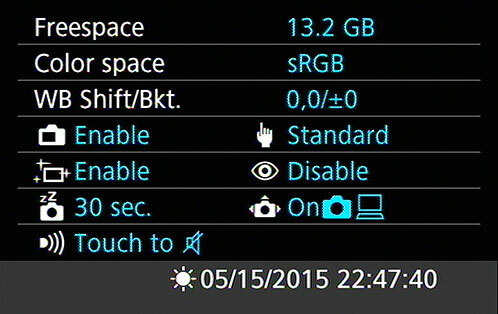 In addition to the Shooting Settings display on your Rebel T6i/750D, you can view a collection of additional settings data via the Camera Settings display, shown here. This screen is purely an informational tool, however; you can’t actually adjust any of the reported settings from this screen. Press the Info button when the menus are active to view this screen. You get to the Camera Settings screen via the Info button. However, you have to be viewing the Shooting Settings screen when you press it. If you’re in Playback mode, the Info button changes the amount of information shown. If you happen to be in the menu system, the Info button displays the Shooting Settings screen. The data displayed varies depending on the setting of the Mode dial; the figure shows you the data that appears in the P, Tv, Av, and M exposure modes. If a setting can’t be adjusted in the current exposure mode, it disappears from the screen. Freespace: Indicates how much empty storage space is left on your camera memory card. White Balance Shift/Bracketing: Indicates the amount of White Balance shift or bracketing, an advanced color option. Live View Shooting and Touch Control: These two functions share a line on the screen. The first readout tells you whether Live View is enabled; the second shows the Touch Control setting. Sensor Cleaning and Red‐Eye Reduction flash mode: This reminds you of your sensor‐cleaning settings. The symbol on the right indicates whether the flash is set to Red‐Eye Reduction mode. Auto Power Off and Auto Rotate Display: The left setting shows you the delay time selected for the Auto Power Off option, found on Setup Menu 1. The right symbol reflects the setting of the Auto Rotate option on Setup Menu 1, which determines whether pictures are rotated to their proper orientation during playback and when you view them on your computer (assuming the software you use can read the rotation data embedded in the image file). The symbol shown in the figure indicates that both rotation features are enabled. Beeper: This indicates the current setting of the Beep option on Shooting Menu 1. The icon shown in the figure indicates that touch screen sound effects are disabled. Date/Time: The last line of the display shows the date and time, which you enter via the Date/Time/Zone option on Setup Menu 2. The sun symbol at the beginning of the line indicates whether you told the camera to adjust the time automatically to account for Daylight Saving Time. Of course, with the exception of the free‐card‐space value and the time, you also can simply go to the menu that contains the option in question to check its status. The Camera Settings display just gives you a quick way to monitor some of the critical functions without hunting through menus. To exit the Camera Settings screen and return to shooting mode, press the Info button or press the shutter button halfway and release it. You also can press the Menu button to access menus.